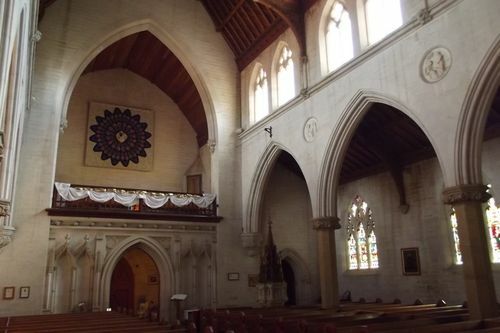 The Rose Window Tapestry in St Saviour`s Cathedral commemorates the 150th anniversary of the Diocese of Goulburn. The 3-metre diameter “window” would be exhibited occasionally away from its St Saviour’s home, together with a memorial book preserving the names of people who subscribed to the tapestry’s cost. The first Bishop of Goulburn, Mesac Thomas, was consecrated at Canterbury in 1863, by the then Archbishop, after Queen Victoria had granted St Saviour’s Letters Patent to make it a cathedral - thus bestowing city status on Goulburn to make it Australia’s first inland city. Goulburn holds the unique distinction of being proclaimed a city on two occasions. The first, unofficial, proclamation was claimed by virtue of royal letters patent issued by Queen Victoria on 14 March 1863 to establish the Diocese of Goulburn. It was a claim made for ecclesiastical purposes, as required by the traditions of the Church of England. The letters patent also established St Saviour's Church as the cathedral church of the diocese. Letters patent held authority only over those who submitted to it voluntarily, and then only within the context of the church. It had no legal or civil authority or implications. So Goulburn was again officially proclaimed a city on 20 March 1885, removing any lingering doubts as to its status.